The Arado Ar.240 was a German twin-engine multi-role heavy fighter aircraft developed for the Luftwaffe during World War II by Arado Flugzeugwerke. Its first flight was in 1940, but problems with the design hampered development and it remained only marginally stable throughout the prototype phase. The project was eventually cancelled, with the existing airframes used for a variety of test purposes. The Ar.240 came about as the response to a 1938 request for a much more capable second generation heavy fighter to replace the Messerschmitt Me.110, which was becoming outdated. Both Arado and Messerschmitt responded. Messerschmitt's response, the Me.210, was a totally new design, but thanks to Messerschmitt's experience with the Zerstörer ("Destroyer") concept, it would be able to enter service quickly. Arado's design was considerably more ambitious for the smaller firm, a dream project of Arado's chief designer, Walter Blume, since the mid-1930s. While it would take some time before deliveries of the Arado design could begin, the Reichsluftfahrtministerium (German Aviation Ministry, RLM) was nevertheless interested enough to order prototypes of both designs. Prior to this point, Arado had invested heavily in several lines of basic research. One was the development of the "Arado traveling flap" which offered excellent low-speed lift performance. Another was ongoing work into the design and construction of pressurized cockpits, which dramatically lowered pilot fatigue for any flight above about 4,500 m (14,760 ft). Finally, they had also invested in a technically advanced remote-control defensive gun system, which they had been experimenting with for several years. The system used a gun sight located in the rear cockpit, operated by the navigator/gunner, which had optics on both the top and bottom of the aircraft allowing aim in any direction. The gun sight was hydraulically connected to well-streamlined "pancake"-shaped turrets on the top and bottom of the aircraft. For the Ar.240 design, the Arado engineers combined all this research into a single airframe. For outright performance, they used as small a wing as reasonable, thereby lowering parasite drag (at the expense of greater lift-induced drag). Normally this would make the plane have "impossibly high" landing speeds, but this was offset by the use of a huge traveling flap and leading edge slats for high low-speed lift. When the flaps were extended, the upper portion of the ailerons would remain in place while the lower portion extended rearward, essentially increasing the wing area. The Daimler-Benz DB 601 inline engines were conventionally installed and equipped with a three-blade fully adjustable propeller. The radiators were somewhat unique however, quite similar to those fitted to the Junkers Ju.88 which pioneered them, consisting of an annular block located in front of the engine, but with the Ar.240 partially covering each of them in an oversized propeller spinner, with the air entering through a large hole in the front of the spinner and exiting out the cowl flaps. As with the Jumo inline-powered versions of the Ju.88, this made the plane look as if it was mounting a radial engine, and the Ar.240, like later Jumo inline-powered fighter aircraft from the Focke-Wulf firm (the Fw.190D, Ta.152 and twin engined Ta.154) also benefited from the simpler setup of an annular radiator just forward of the engine. The fuel cells in the wings were provided with a newly developed self-sealing system that used thinner tank liners, allowing for more fuel storage. The liners could not be easily removed as they stuck to the outer surface of the tank, so in order to service them, the wing paneling had to be removable. This led to a complex system for providing skinning stiff enough to be handled in the field, complicating construction and driving up weight. As with all German multi-use aircraft designs of the era, the aircraft was required to be a credible dive bomber. The thick wing paneling wasn't suitable for piercing for conventional dive brakes, so a "petal"-type brake was installed at the extreme rear of the fuselage which opened to the sides when activated. When closed the brake looked like a stinger, extending beyond the horizontal stabilizer and twin fins. Finally, the cockpit was fully pressurized. This would not have been easy if the armament had to be hand-operated by the gunner, as it would have required the guns to penetrate the rear of the cockpit canopy. However, the remote control system allowed for them to be located in turrets in the unpressurized rear of the fuselage. 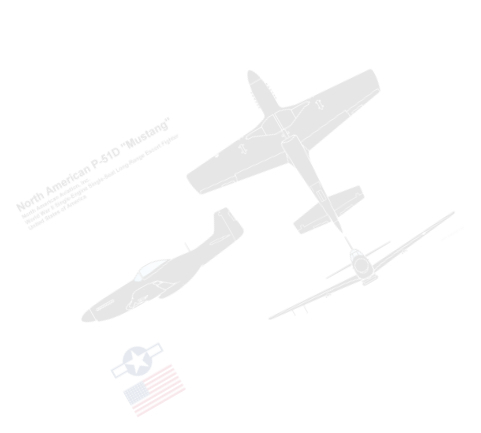 All of this added weight combined with the small wing led to a very high wing loading of 330 kg/m² (221 lb/ft²), compared to an average of about a 100 for a single-seat fighter. Technical specifications were first published in October 1938, followed by detailed plans later that year. In May 1939, the RLM ordered a batch of six prototypes. The first Arado Ar.240V1 prototype (DD+QL) took to the air on 25 June 1940, and immediately proved to have poor handling in all axes, and it also tended to overheat during taxiing. The handling was thought to be the result of the ailerons being too small given the thick wing, so the second prototype was modified to have larger ones, as well as additional vertical fin area on the dive brakes to reduce yaw. In addition small radiators were added to the gear legs to improve cooling at low speeds, when the gear would normally be opened. Arado Ar.240V2 (KK+CD) first flew on 6 April 1941, and spent most of its life at the factory in an experimental role. Arado Ar.240V3 followed, the first to be equipped with the FA 9 rear-firing armament system, developed jointly by Arado and DVL, armed with a 7.92 mm (.312 in) MG 81Z machine gun. Arado Ar.240V4 was the first to include an operational dive brake, and flew on 19 June 1941. The Arado Ar.240V5 and Arado Ar.240V6 followed in December and January, including the upgraded FA 13 system using two 13 mm (.51 in) MG 131 machine guns in place of the MG 81Z for a considerable boost in firepower. The Arado Ar.240's excellent performance quickly led to the Arado Ar.240V3, Ar.240V5 and Ar.240V6 being stripped of their armament, including the defensive guns, and used as reconnaissance aircraft over England, where no other two-seater could venture by 1942. Arado Ar.240A-0: Four pre-production aircraft. Arado Ar.240C-1: Heavy fighter version. 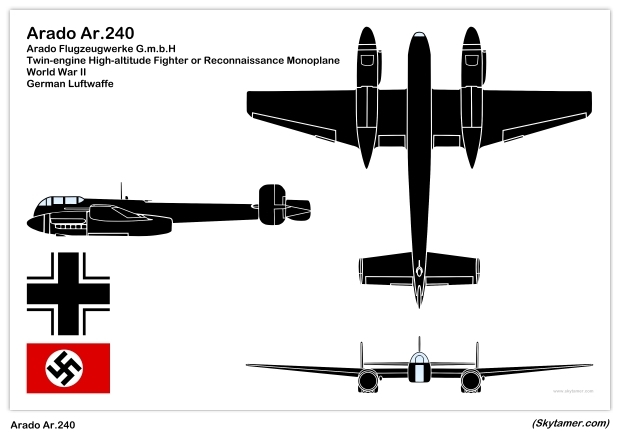 Arado Ar.240C-2: Night fighter version. Arado Ar.240C-3: Light bomber version. 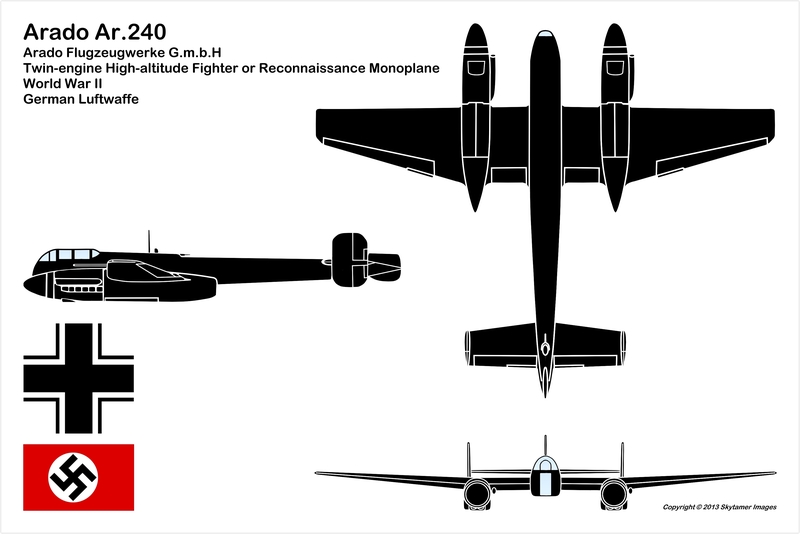 Arado Ar.240C-4: High-altitude reconnaissance version. The project was abandoned in favor of the Ar.440. Arado Ar.440: Improved variant with the fuselage stretched by 0.9m (35.5 in) and powered by the 1,900 hp (1,417 kW) DB 603G, the production aircraft would have had two 2,000 hp (1,491 kW) DB 627A/B engines. Prototype converted from a prototype Ar.240, total of four built in 1942. The type did not enter production and the program was cancelled in 1943. Twin-engine high-altitude fighter or reconnaissance monoplane. Outer sections have straight leading-edge and swept forward trailing-edge. Fuselage is continued to a point beyond the tailplane, the rear extension carrying small stabilizers and a dive-brake. Cantilever monoplane type with twin fins and rudders. There is also a third vertical fish-tail fin at the extremity of the fuselage. Each main unit, fitted twin wheels, raised backwards into engine cell, hinged doors closing the aperture when wheels are retracted. Two Daimler-Benz DB 601E, 1,200 hp, twelve-cylinder inverted Vee liquid-cooled engines. Engine nacelles extend aft of the trading-edge of the wings. Eight fuel tanks in wings and one in fuselage. Total fuel capacity 603 Imp. gallons. Crew of two, consisting of pilot and navigator/air-gunner, seated back-to-back in pressurized cabin in nose of fuselage, and ahead of the wings. and four MG 151 in two 2-gun remotely-controlled turrets, one above and below the fuselage.